It’s winter, and the days are short. As I write this in the first week of January, we currently have 9 hours and 17 minutes of daylight. As farmers, we often refer to this time of year -- when daylight falls below 10 hours per day -- as the Persephone period. During this period, regardless of the temperature, plant growth slows to a near-halt. The greens that we’ve been harvesting from for our Winter CSA put on most of their growth in October and November. (This is why the process for winter greens actually began on a 70-degree day in September!) These days, the plants are mostly hanging out, waiting for that critical increase in daylight hours to signal renewed growth. Those of you who leave your office at 5pm to darkened skies are probably acutely aware of the brevity of daylight hours. But don’t despair: there’s a light at the end of the tunnel! Though it may seem (especially now that the holidays are over) that the winter stretches out, endless, ahead of us… the truth is that with the Winter Solstice behind us, the days are already growing longer. For now, the farm crew -- taking a cue from the plants -- have also slowed down. We are taking advantage of more flexible time in the winter to rest and rejuvenate. While Leon is snuggling his new baby daughter, LK and German are both reading Sapiens: A Brief History of Humankind (which for German is the first of fifty books he plans to read in 2019); Chris has been doing lots of hiking with his curious and adventurous pup; and Laura is making jams from squirreled-away summer fruits and painting vegetable portraits (like this beautiful arrangement she made for Lauren’s going-away card!). Speaking of Lauren McDonald, our dear friend is settling into her new home in Belfast, ME with her partner Julia and their rambunctious cat Turtle Bean. She’s preparing for lots of fiddle gigs, savoring every bite of her dwindling supply of purple carrots, and sending warm wishes to all of us (and you!) here while making new farming connections in Maine. Just like these candy-sweet overwintered turnips that amazingly not only survived the winter cold, but thrived -- so are we not only enduring these dark days, but enjoying them for all that they are. We hope your New Year is off to a healthy and happy start, and that you too are taking advantage of these Persephone period to snuggle up on the couch with a good book, enjoy a steaming mug of hot chocolate or tea, and generally adopt a Scandanavian winter mindset towards these short but precious days. The tractor implements are stored for the season. The distribution tent is down. The fields are quiet, tucked away in cover crop. To a casual observer, it may look like a whole lot of nothing-much happening. But inside the high tunnels, it’s another world. Look closer, and you’ll find a lush green world, bursting with kale and chard, spinach and salad greens, chicories and tatsoi and bok choy (oh my!). These heated tunnels, which we’ve been planting and weeding and watering, opening and closing (and mending) for the last three months, are now the heart of our winter activity -- and a welcome, semi-tropical respite from the frigid fields. Our greenhouse, which will be piled high with trays of seedlings and sprouts come spring, has been temporarily transformed into a winter wash station. And our coolers are well stocked with carrots, sweet potatoes and other root crops, cabbage, onions and winter squash. We will spend the next few months buzzing back and forth between the tunnels, the coolers, and our wash station, harvesting and washing and sorting and packing out a beautiful assortment of produce for our Winter CSA. We are really excited about our Winter CSA (a more traditional-style CSA) and the opportunity it affords to slow down a little with our members -- to talk with people, share recipes, and spotlight unique and different crops. As farmers, we’re also deeply grateful to have winter work. It keeps us learning, keeps us employed, and is one important part of the sustainability we strive to achieve here on the farm and across the organization. For those of you who have signed up for the Winter CSA, we thank you for supporting us in this. We will see you for the SECOND distribution on Saturday December 15 -- and we hope you’ve made room in your refrigerator! Stay tuned for recipe ideas (including more for the ever-intimidating but vastly under-appreciated Black Spanish radish). For everyone else, we wish you a warm and cozy, happy and healthy holiday season. Be safe, eat your greens, and we will look forward to seeing you in the spring! It’s November. (How did that happen?) The leeks are all harvested, the garlic has been planted (all 17,400 cloves), and we’re getting ready for winter. And while it’s always a little sad to see the growing season come to a close, this November comes as a bit of a relief, as it marks the end to a pretty tough year. With all of the hot and wet weather, we saw some significant losses this season. Our edamame planting was lost to a pest that feeds on germinating bean seeds. We lost half of our first planting of peppers to heat stress, and had a curiously light eggplant harvest. The seemingly endless rain took a toll on our chard, beets and carrots. Diseased greens meant not enough chard, and very small beet and carrot roots. (Whereas last year we harvested nearly 4 large bulk bins of beets, this year we harvested only one, from the same amount of land.) Nearly all of our celeriac and winter rutabaga was lost to rot. While some crops succumbed to the weather, others thrived. We had a great garlic crop, and an outstanding onion crop! We brought in 2,000 lbs of garlic and over 11,000 lbs of beautiful golden and red onions. Our carrot germination and weeding was spot-on, and (before the disease) it had never looked better. The raspberries were bountiful, and provided many weeks of picking. The diseased basil, forgotten about behind the hot peppers, returned from a diseasy August for a late-summer burst! We have peppers at the end of October! Despite some failure in our winter storage crops, the purple and white daikon are looking pretty stellar, and the butternut are still bountiful. We also took some risks trialing new varieties. We tested out a few different potatoes, a new rainbow carrot mix, a new winter squash (the hazelnut-flavored Black Futsu), and a stunning purple Chinese cabbage, to name a few. Last year’s onion trial resulted in a sturdy storage onion that’s been holding well this year, and promises many more weeks of onion distribution into the winter CSA. Perhaps one of the brightest and best parts of this challenging year has been the endless support we receive from all of you, our members and shareholders. We receive so much support, in the form of smiles, words of appreciation or encouragement, surprise deliveries of baked goods or pain relieving ointments, extra volunteer hours (in response to one of my desperate calls for hands), and a shared curiosity and interest in the work we do and the land we care for. On a personal note, it always makes my day when you, our shareholders, ask questions (anything from why we didn’t have edamame this year to why the kale looks different) to learn more about your food and how its grown. I can’t tell you how many times I’ve felt uplifted working across from one of you during workshare hours -- how touched I’ve been by the stories you all have shared, by your generosity and kindness and diversity of perspectives in this PFP community. Support is, in fact, one of the central cores of a CSA -- community supported agriculture. And so, as the close of the season draws near, we’d like to take a moment to express our gratitude for the bounty, for feeding us; for the losses, for teaching us how to grow and be stronger; for the winter, for providing rest and respite and the opportunity to reset; and to all of you, for sticking with us year after year, and allowing us to grow for and with you. Thank you. We’re back! And we have GARLIC! Garlic is something most of us see year-round in the grocery store. It’s one of those crops that we don’t always think of as being “seasonal”, or having a “season”. But follow any farmer’s social media account, and you’ll pretty quickly see that garlic does indeed have a season: and that harvest season is July. Our garlic’s story begins in October of last year, when we planted it into a layer of plastic mulch. (The plastic mulch helps retain moisture, suppress weeds, and warm the soil in the spring.) The garlic must undergo a cold period in order to form a nice fat bulb -- and so it spends the winter out in the ground, waiting for spring. In March, as the soil warms, the garlic sends up little green shoots… and soon, so do lots of weeds. Weeds like grasses, that threaten to spread their dense, deep root systems and steal all of the garlic’s nutrients, and amaranth and lamb’s quarter, whose big wide leaves will take up all the sunlight and shade out the garlic. So we weed. We cultivate the pathways with the tractor, we hoe the sides that the tractor missed, and we weed the holes with our hands. We do this more than once. With careful weeding and watering, the garlic sizes up. By the time it’s about waist-high, in early June, plants start to send up tall, squiggly poles from the center: the scapes! If left to mature, the arrow-shaped tips of the scapes will swell to create a bundle of mini-bulbs, called “bulbils” -- and will draw on nutrients stored underground, in the cloves, to do so. In order to get fat juicy bulbs, we harvest the scapes in June. This forces the plant, which wants to make viable seed, to go to Plan B (the bulb). From June to July, the green leaves of the garlic plants start to turn yellow and brown at the tips. This process, called senescence, is one of the first indicators that harvest time is approaching. On a recent field walk, Leon showed us another, more reliable indicator: after pulling a bulb from the ground, he sliced it in half crosswise, revealing the hard neck. As cloves mature, they begin to pull away from the neck, leaving tiny gaps of space. At this point, the garlic is pungent and fat and ready to harvest! 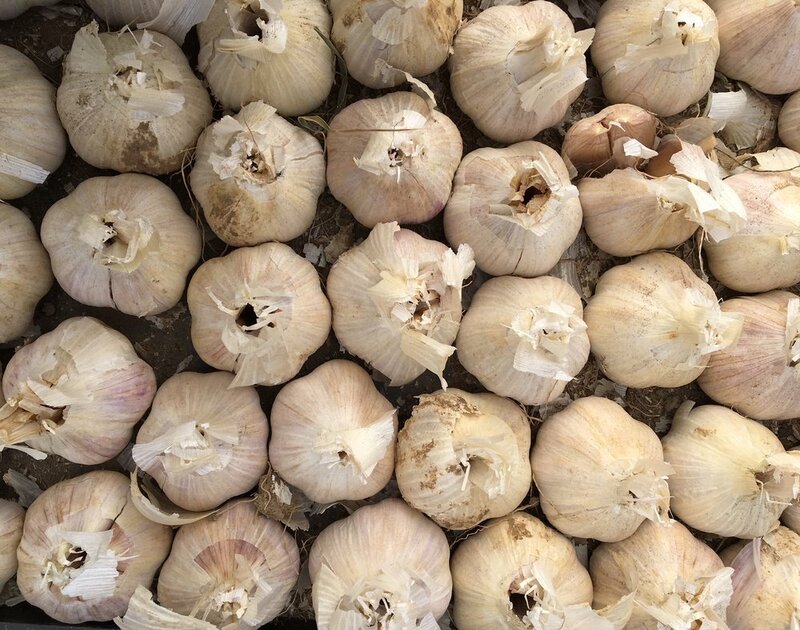 From this year’s garlic harvest, we will sort out the largest cloves, which will themselves become the garlic harvest of 2019. Grower's Row: Spring is Springing! It was 40. Then it was 80. The next day it was snowing. Ah, March. It should come as a surprise to precisely no one than you, you wild crazy month, are responsible for this trickery. Despite having experienced all four seasons in the span of a few days, it is still officially winter (we had to check the calendar to make sure) – but not for long. Increasingly longer days mean that our winter routine is already giving way to the considerations of spring. Over the winter, our days have been occupied with harvesting greens and washing roots for our bi-weekly Winter CSA, and filling wholesale orders (including deliveries to Vassar College, where our produce appears in the dining halls). Thanks to our Vassar students and volunteers, we’ve also been chipping away at projects like fence clearing, bed prepping, organizing, and cleaning. On particularly inhospitable days, we take cover indoors to update our record keeping, prepare for the arrival of new staff, and prepare ourselves for a change in responsibilities, as many of us transition to new roles. Now, as the days lengthen, we’ve been watching things shift in the high tunnels. The few remaining Asian greens are starting to flower, meaning we get to eat the delicious raab, or flowering stalks. 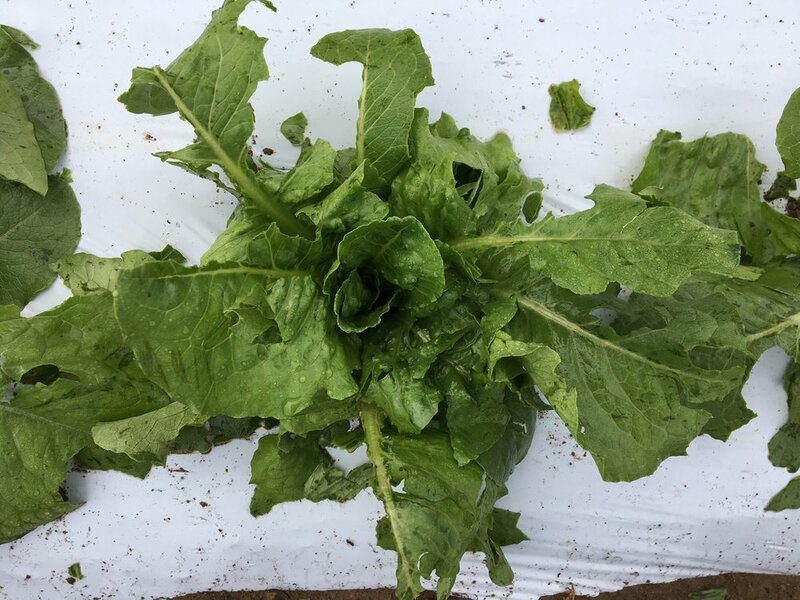 Beds that have been cleared of winter greens have been direct seeded with arugula, mustard mix and radishes – which are germinating beautifully, and will hopefully grow fast enough to be harvestable and cleared out by the time we need to plant tomatoes in early April. Yes. That means we are seeding tomatoes THIS WEEK, the very first week of March. About 3 weeks later we’ll pot them into larger cells, and by early April they’ll go into the protected grounds of the tunnels. Some of these tomatoes—as well as a diverse array of other vegetables, herbs, flowers, deer-resistant plants (ones that often have strong oils or textures that deer can’t digest) and plants that are good for pollinators—will be destined for our Plant Sale in early May. If all goes well, we’ll harvest them from July through October. Hard to picture that right now in March! What’s even harder to believe is that we’re also starting seeds for CSA crops that members won’t actually eat until September (onions), October (leeks), and even next January (celeriac)! Between tunnel and CSA plantings and plant sale crops, we’ll be starting 50,648 seedlings during the first three weeks of March. In short, spring is most definitely springing… and we, too, are springing to action, ready to meet it. To get in on the fun, sign up for your 2018 CSA share here, and mark your calendar for the PFP Plant Sale May 5 and 12. It’s not too soon to start thinking about your own gardens, or about welcoming the summer bounty that we’re already setting in motion. Here at the farm, it’s the calm before the storm. Already, the light is longer, and the sun is setting later. Soon, the spring seeding will begin. Soon, we’ll be joined by a bright-eyed and eager group of Vassar students, who will be working on the farm as part of a Community Engaged Learning program. Sooner than we realize, the bell curve of the season will slope steeply uphill, and before we know it we’ll be knee-deep in onion transplants and harvesting hundreds of pounds of cucumbers. But for now, everything is still cold and quiet. Quiet is nice… but it’s also a little lonely. The woodchucks and wild turkeys are nowhere to be seen. The songbirds are quietly snuggled into their shelters. Rarely these weeks have we seen runners, dog-walkers, or frolicking students around the preserve. It seems only the geese (and, once every two weeks, our intrepid winter CSA members) are braving this cold snap to venture out and visit us! And so, in an effort to bring some fresh new (human) energy onto the farm, we recently decided to offer a volunteer day. Our awesome Education team answered our call, and came out with a bounty of positive energy and enthusiasm (along with a few representatives of Vassar College, Dutchess Outreach, and our new Interim Director, Ray Armiter) for some mid-winter farm work. The tunnels were buzzing! In just a few short hours, this amazing group of 15+ completely cleared out and prepped Tunnel 4, removing roughly 200 lbs organic materials to the compost pile and broadforking all three beds to be ready to receive transplants -- and still had time to clear out nearly half the chickweed in Tunnel 2. For the farm team, it was energizing to have some new (and familiar) faces out working with us -- and everyone who came out to help left with dirty hands and big smiles. In fact, it was so much fun that we’ve decided to do it again: every Tuesday. We’ll be here, holding open volunteer hours, every Tuesday from 10am-12pm. If you’re interested in joining us, please email me at crew(at)farmproject(dot)org to let us know you’re coming -- or just show up. Don't you want to have this much fun? Or, if “down time” is more your speed, consider getting cozy in your kitchen with one of these recipe suggestions! All this cold weather is a great time to do some roasting, boiling and baking, and to experiment with foods like celeriac, kohlrabi, and rutabaga. Tune in next week for another round-up of recipes to accompany the February 3 CSA distribution. However you choose to spend the rest of your winter, we hope you find ways to appreciate these darker, colder days (after all, what would the first tomato of the season be without it?) and joy in the little things -- like the harsh honking sound of a flock of geese, flying overhead, or a feather of frost, or the snap of a bright bite of watermelon radish, or a warm bowl of curried carrot soup. Winter has touched all parts of the farm, it seems. As of last week, the last carrots of the year are finally (!) out of the ground. The winter-kill oats and peas have been, well, winter-killed into a dense matted blanket that will protect the soil underneath until the spring, while the rye cover crop remains an impossibly lush green carpet. The greenhouse has transitioned to a winter wash station, the tunnels have transitioned from tomatoes to hardy winter greens, and the fields are frozen. With the year winding to a close, we've been reflecting on the arc of the season, from the challenges we encountered and the losses we suffered to the overall beauty and bounty of the season. The weather this year took us for a ride. On June 1 we were pelted by marble-sized hail, which destroyed our first harvest of zucchini and strawberries and many of our newly-planted pyo peppers, cherry tomatoes and sunflowers. A prolonged wet spring gave way to a wet early summer: perfect conditions for disease, from which a number of crops (our peppers in particular) suffered significantly. And there was significant pest pressure in our early potatoes, and in our cucurbits: first cucumbers and then winter squash. But there were high points too! After weeks of measley pepper harvests and a few weeks where we thought the plants were finished, our pepper plants picked up with the drier, sunnier weather of early autumn; they surged with new growth and new fruit! Amazingly, we found ourselves harvesting poblanos until nearly November. Our carrots, thanks to years of refining a system of direct seeding, rolling (to ensure good seed-to-soil contact), flaming and hand weeding, have been fantastic this year. Red beets and sweet potatoes did very well, the kohlrabi were colossal, and the raspberries and blueberries are always highlights of the season. We trialed some new crops, including Sugarcube cantaloupe, rainbow carrots, purple top turnips, sweet corn and speckled chicories. 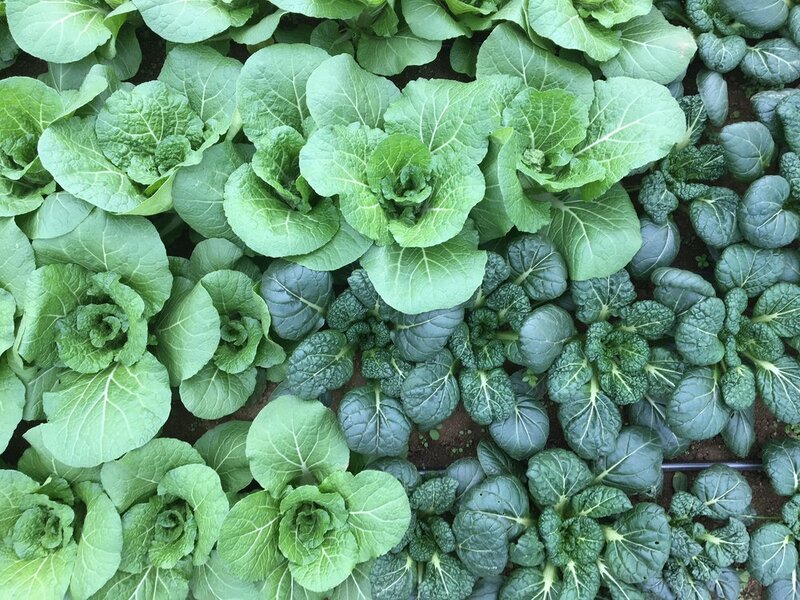 The high tunnels that pumped out some 18,500 lbs of tomatoes over the warmer months, are now providing shelter for a thriving crop of kale, cut greens, and mixed Asian greens such as bok choi, yukina savoy, tatsoi and napa cabbage. Overall, we grew over 195,000 lbs of food this season -- and donated nearly 26,000 pounds of food to Poughkeepsie area food banks, schools and soup kitchens. 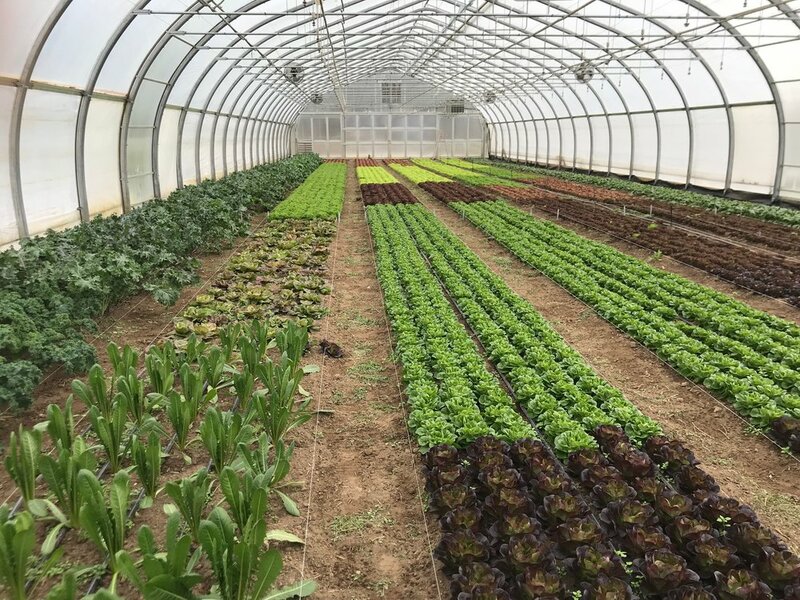 Thanks to our heated high tunnels, we're still growing, and donating. And vegetables aren't the only things we grew this season. 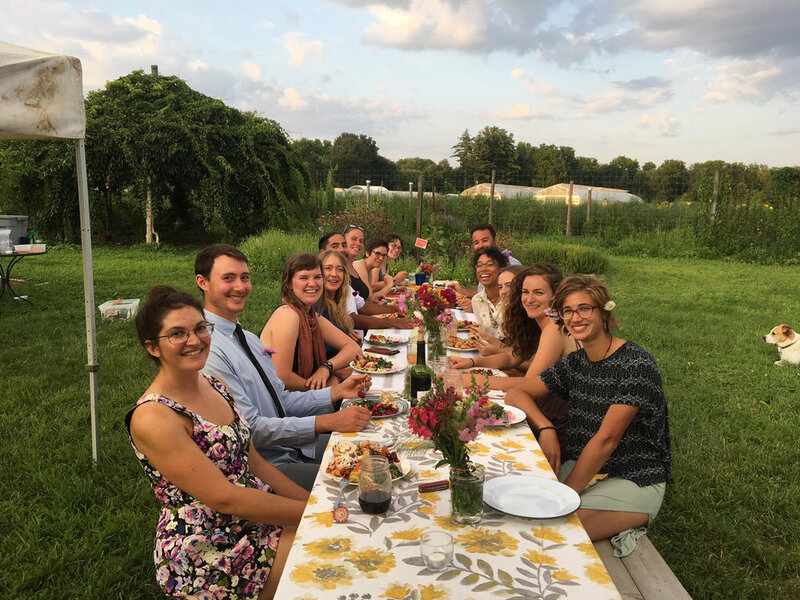 We grew some wonderful relationships with our fantastic crop of interns this year, and think of Fiona, Liz, and Sarantia (and all the things we learned from them, and with them) often. And we have cultivated some new relationships that have allowed us to provide some of our produce to the Poughkeepsie City School District and to Vassar College students in their brand new dining facility. As we take this last week of the year to go home to our various corners of the country and be with our families, I at least am spending some time reflecting on how grateful I am to be a part of the Poughkeepsie Farm Project family. This has been my best year of farming yet, and so much of that has to do with the wonderful people that make up this team, and with you amazing CSA members who go out of your way to bake for us, to smile while you're working, to ooh- and aah- over the produce we've grown, to volunteer over the winter for no other reason than that you like working in the soil, and to thank us: your voices of appreciation are what keeps so many of us going, doing the work that we do. Thank you! We look forward to continuing to grow for and with you in 2018. The majestic Hudson Valley sprawls roughly 7000 miles throughout New York; drive through any of the towns or cities from Albany to Yorktown and you’re bound to cross paths with one of the many bountiful farms, orchards, or vineyards sprawled throughout the state. Here in the Hudson Valley, we’ve been quite fortunate to receive access to incredible produce and meats. While this is partly due to increased consumer interest (you!) in sourcing locally and having a greater connection with local farmers, a large reason why we have such quality product is due to the hard work and pride that these farmers put into their craft. For smaller farmers, the work and labor can often be extremely difficult and the days quite long, but the finished result is often extraordinary. Enter Pat Knapp and Allison Toepp of Back Paddock Farm. Now located in Ghent, NY, they have been raising cows since April of last year – more specifically, a herd of 100% grass-fed Red Devons. These cows have a storied history; the first Devons to come to America date all the way back to the 17th century. These purebred and docile bovines have thick skin, are efficient eaters, and their coat color can range from a deep ruby color to light red. In short, they are excellent cattle; a quality animal - raised responsibly and with care – ultimately creates a better product from the farm to your fork. A short while ago, I had the chance to speak with Pat, who graciously explained a little about their operation. PFP - How did you get started with the farm? Can you tell me a little about the Hudson Valley Farm Business Incubator? Pat - I was working with Allie at Sprout Creek Farm in Poughkeepsie. We worked well together, and realized we wanted to start a business. We drew up a plan and applied [to the Hudson Valley Business Incubator] and were accepted. They provided us with just the space; we shared some land, equipment, and resources with a couple of other farms. We were able to get our feet wet. It allowed us to get people to know what we were doing in a way where this reputable organization was backing us and supporting us. We did some fundraising with some close friends and family who wanted to invest in our future, we bought a herd, and then we just started doing it! You have grass-fed Red Devons at your farm along with log-grown mushrooms – and you want to mimic nature’s perennial process. Can you explain how you aim to do this? We implement a management-intensive rotational grazing system. Cattle, and livestock in general, get a bad rap and a lot of blame for a lot of environmental problems, perhaps rightfully so. More often than not, it’s not the animals intrinsically that are responsible for environmental destruction, but more the management. [Famed conservationist] Allen Savory has really promoted this style of regenerative agriculture where cattle can serve this extremely unique purpose of creating a positive impact that we would [otherwise] not be able to do without cattle or another large mobile herbivore. We rotationally graze to benefit the land in the same way bison and wild herbivores would, and we’re always focused on not just creating a diverse ecosystem (and a robust one), but we’re really focused on building soil organic matter; this is the only way that we can be taking carbon out of the air and put it back into the soil. It’s our own little form of environmental activism. As we develop our land base, one thing that we want to be doing is responsibly tending to the forested areas of the farm. Again, we want to create a real carbon sink in the forest, where we’re not letting the plants and trees fall and decay – we want to be intensively managing our woodlot so that they can be a productive part of the farm ecosystem as well. Eventually, we’d like to be thinning out some of these forests and creating a silvo-pasture – essentially a man-made savannah where the entire area will be in shade. [BPF] will be thinning out trees and putting down grass seed; by turning that into a twice-productive perennial system, the animals will be able to graze underneath, keeping the forage plants vegetative. The hardwood trees that we’re tending to will be harvested for shitake mushrooms production, and then we hope to turn some of the hayfields into fruit and nut production. Most cattle out there really can’t finish well on [a 100% grass diet]. The industry has kind of moved toward a system based on corn and grain (and fuel), and we’ve got a long road backwards, almost, to be able to get animals back to a point where we can consistently create tender, high-quality meats on grass alone. We’re part of a breed improvement program, [with mentors and colleagues Mike Scannell and Joan Harris of Harrier Field farm , among others] where we’re really trying to build up the breed forward with an eye towards a quality end product. As we’re working with butchers and chefs, they can give us a higher level of feedback, which is important. We measure our cattle; there’s a system of linear measurement and ratios that cattlemen before us found tends to correlate to quality and tenderness, as well as creating a more efficient animal that can produce more pounds of high quality meat per acre of grass. [When BPF first began] I was coming with the idea to [raise the herd] from a strict Allen Savory perspective. Mike Scannell challenged that by saying it wasn’t enough, and that it was only half of it. The other half of [raising the cattle] is the breed improvement side of things, where if you’re not improving cattle, you’re degrading – in the same way that if you’re not improving soil quality and the health of an ecosystem it can degrade as well. We’re trying to make the most of this land, and [we] have to try and maximize the amount of quality meat that we’re able to produce per acre. Part of that is improving your fields, but part of that is improving your cattle. The combination of [the ideas and methods of] Allen Savory plus my friend Mike Scannell really just kind of took us places. We’re trying to do things in the most straight-forward way we know how. It’s a very kind of raw and pure way to do what we’re doing; we aren’t working with huge machines and government-subsidized] grains. It’s unique in the way that we’re looking to nature rather than mechanization for inspiration in efficiency. [BPF meat] is not just something that’s easy to eat, but is something that people can morally get behind to promote their ideal of animal welfare and create a positive environmental impact through their eating choices. We really make an effort to do things that cater to all kinds of ideals. ***PFP features Back Paddock Farms’ wonderful retail cuts at every CSA pickup offered at the farm. You don’t need to be a member of the CSA in order to buy, and there’s a wide variety of cuts to choose from! Editor's Note: This post was originally scheduled for late June publication, and I apologize for the delay! What a difference a day makes. This aphorism sums up my swift-moving first month as an intern at the Poughkeepsie Farm Project. These warm June nights and regular, welcome rains are inciting the plants to fill out markedly more each day at a rate that continues to astound. The winter squash (and most other cucurbits, a family that includes melons, cukes, and zucchini) that we planted in early June had to be covered with Reemay, the white fabric that you see stretched over hoops in many of the fields, to protect the young plants from a booming population of cucumber beetles. Any day now, the flower buds developing on the plants will bloom, requiring us to uncover the beds to welcome in pollinators. Accordingly, how quickly the offerings in the distribution tent have expanded (as I'm sure you all have noticed)! The first week featured an array of greens and a few petite Hakurei turnips and radishes. Now with the ushering in of zucchini and cucumbers (two crops that demand harvesting three days a week in this time of rapid growth), as well as cabbages, it seems the tent can hardly contain the bounty. Another thing worth mentioning here is my amazement and gratitude at the abundance of eager help in the fields from members, without whom the harvesting days would be a true challenge. With all these extra hands, the amount we are able to clear out of the fields before noon is truly remarkable. These hours are also a fantastic opportunity to connect with community members in conversation. As a newcomer to the Hudson Valley, I am pleased to get acquainted with this crew of farm-invested New Yorkers and hear all about places to see and hike in the area. Speaking of members, one thing that I love about this method of CSA distribution (I come from a land where boxes are the norm, which does not require members to go directly to the farm nor allow the ability to choose which vegetables go home with you) is the opportunity for conversation and the exchange of ideas. I've often overheard members eagerly sharing recipes for things like beet greens, kohlrabi, and escarole in the tent. If you are at all like me, it is easy to get into cooking ruts and run out of creative steam when eating the same foods for many weeks, hence the boon of this face-to-face exchange, stimulating our interest and allowing us to branch out in the ways we can enjoy preparing these delicious yields. As a wise permaculturist friend of mine famously says, "Point of view is a limit, community a remedy." (Bruce Bacon, Garden Farme) These are fine words to live by, and to serve as a reminder that it never hurts to reach out and inquire around us. If you see something unfamiliar in the tent and have questions about how to eat it, please feel welcomed to ask the farm staff or pose your curiosity to your fellow members!